← Interest Rates and Hawaii Residential Prices–Are They Really Connected? Very often, I’m asked for specifics about a new high rise condominium development in Honolulu. I decided to compile a concise list. There is an enormous amount of development activity happening in Hawaii right now, especially in urban Honolulu. Major developers, lenders, and landowners are involved, including: Alexander and Baldwin (A&B), Howard Hughes Corporation, The MacNaughton Group, Kobayashi Group, OliverMcMillan, Tradewind Capital, Kamehameha Schools, Stanford Carr, American Savings Bank, Bank of Hawaii, Central Pacific Bank, Wells Fargo, and First Hawaiian Bank. As I started to put this list together, I quickly realized that the variety of residential projects being planned was staggering: High-rise condos, student housing, timeshare, hotel, high-rise apartments, low-rise condominiums, senior housing, and even affordable housing for artists! An active development plan on track for approvals, financing, and construction. This link: http://binged.it/13RCPpX takes you to an interactive Bing Map that shows photos and details of each project. 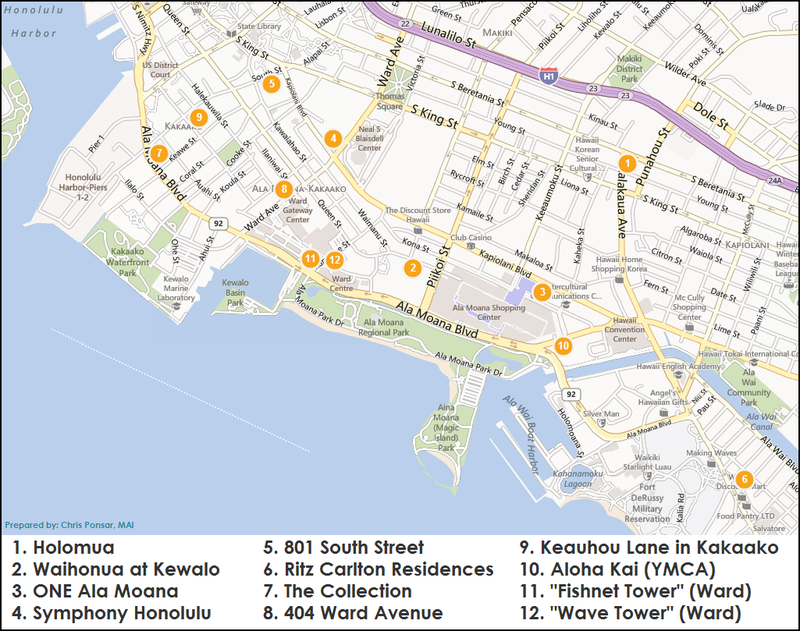 As shown, most of the activity is in Kakaako. Great overview. I notice that sweet spot for the number of stories seems to be about 40. I was wondering what factors might be behind that in Honolulu. When I did property risk analyses at a few towers in Miami a couple of years ago, I noticed that there was a concentration of properties around the 400 foot range (33-40 floors) but also another group significantly taller, in the 500-650 foot range. Perhaps that’s another aspect of development priorities, but your comprehensive list made me wonder. There is a soft height limit of 400 feet in Kakaako, the area of Honolulu between Waikiki and Downtown. In Waikiki, the height limit is understood to be 350 feet, which was set to be a little less than half of the height of Diamond Head–the obvious intent was to preserve the classic Waikiki skyline.